As many, I observed with interest the recent election of the new Pope. When it was revealed that he was from Argentina and a Jesuit, I felt quite surprised and hopeful. But we were told that beyond his record of speaking and working on behalf of the poor, he would remain quite conservative as far as reform and change of some basic theological positions. So far I admit I am impressed; he has turned down riding around in the specially made Mercedes Benz “pope mobile” to ride in a black Volkswagen. He seems to spurn special papal jewelry, the specially decorated red robes and perhaps even the red pope shoes. I have been impressed even by his name and the fact that a sea gull sat on the smoke stack shortly before his white smoke drifted out! It reminded us of the original St. Francis’ affinity for birds sitting on his shoulder and eating out of his hand. “Maybe he’s even a vegan,” I thought! A few weeks ago, after hearing of Benedict XVI’s intention to resign, I read an article by theologian Hans Kung from Tubingen, Germany. (“Vatican Spring?” New York Times, February 27, 2013) In the 1980’s, Kung lost his ecclesiastical license for teaching in the church having criticized the idea of papal infallibility. I heard him speak shortly afterwards at the Riverside Church in New York City. (Always being drawn to “heretics!) The former pope, St. Benedict XVI had been a colleague teaching with him at the time. He was one of the first teachers which Cardinal Ratzinger reported charges against and had disciplined along with Fr. Matthew Fox and others. Anyway, Dr. Kung wrote in hope for major reform in the election of a new pope, one which would update ancient exclusiveness and the hard-line ideas instilled in the Roman Catholic 11th Century “Revolution from Above”. Then, under Pope Gregory VII, the papacy was made into a system of “centralist-absolutist papacy, a compulsory clericalism and the obligation of celibacy for priests and other secular clergy.” Recent popes such as John Paul II and Benedict XVI have sought to return to that older medieval monarchial rule of the Curia, its governing body. 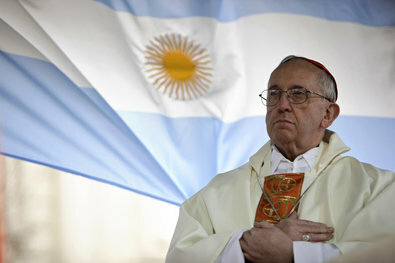 While Francis I was Cardinal of Argentina, he did seek to uplift the poor and those with AIDS. He criticized colleagues who refused to baptize children of unmarried mothers. But at the same time he was adamant about refusing any kind of birth control education and the distribution of condoms among the poor. He allowed no woman under any circumstances to abort a pregnancy. With half of the world today living on less than $2 per day and a billion without safe drinking water, this would certainly be a time I would refrain from criticizing the use of birth control and the condemnation of homosexuality. I would openly encourage birth control education along with the acceptance of our gay and lesbian brothers and sisters as equal and normal. While the 11th century St. Francis gave his life reaching out to the poor, the “Revolution From Above” simultaneously took effect and slaughtered over 20,000 “heretics” throughout Europe. When St. Francis died he was a pauper having asked that nothing be organized in his name. To now have a new pope, the first one to take St. Francis’ name may be far reaching. The largest numbers of Catholics now live in Brazil and Argentina where losses in recent years have been around 20%. Most are leaving for more Pentecostal and Protestant congregations. In Europe the Catholic Church is a small percentage of its earlier, pre World War II days. Hans Kung urges the church leadership to look back into the earlier, pre-Fourth Century times when democracy was permitted with women’s freedoms, flexible doctrines and various liturgies. It seems doubtful such radical changes will soon come, but who knows. Kung is urging for what he calls a “Vatican Spring” similar to the one the Arab countries initiated two years ago. He compares the Vatican Curia, however, as more dictatorial than elected governments overthrown in Tunisia and Egypt. He compares the Curia witho the “absolute monarchy” of Saudi Arabia! Maybe that’s a bit much. However, maybe the “spring” will happen, maybe it won’t. Who knows in this time of instant communication and universal unrest amid questions and doubts about the meaning of freedom and life’s existence. Meanwhile, I will pray for the new pope and continue to live my own life in freedom to explore and experience the universal freedom of God’s Spirit, everywhere, in every person, regardless of name, form, clothing, or government. This entry was posted in Religion and tagged Hans Kung, Pope Francis I. Bookmark the permalink. Hello Dave, I too am intrigued by the election of the new Pope. (I love the name he chose) I was very interested in the process. Can you imagine voting for such an important leader. I wonder… did the Cardinals vote their conscience or did they vote their personal preference. Imagine a group of over 100 where there are so many languages, so many corners of the Earth represented, so many individual perspectives and so many critical struggles??? In 2 days they could come together and discern God’s choice?? (upsetting to think it takes a local congregation years to choose a new pastor) No media, no campaigning, no political bartering, how on this Earth in this day could they do it? Confidentiality? really no leaks? I cannot be sure of all these things, but one thing that I am sure of is that a universal Spirit is present, it has to be! Thank God for hearing our prayers and placing in our hearts the ability to make such choices.